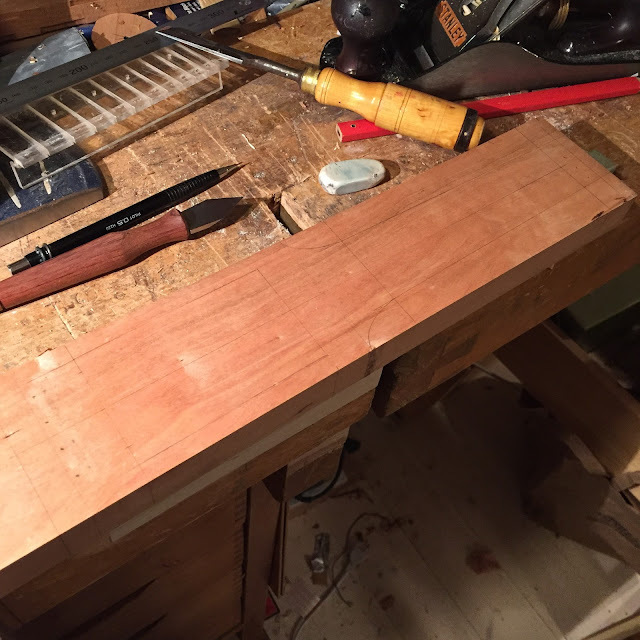 I glued the sides onto the top on the koa soprano, and then I turned to that cherry blank I shaped roughly in the planer last weekend. 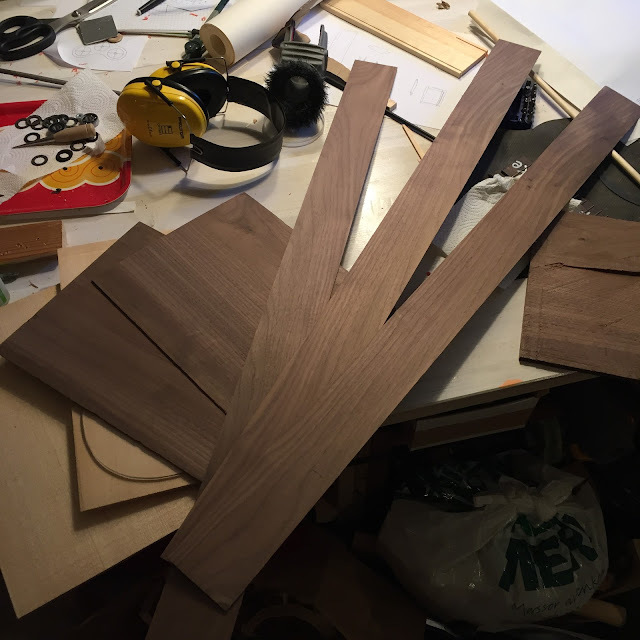 First job was to handplane it on three sides, making it flat and shiny on the face and the edges dead square and parallel. Anyway here it is. Maybe you can see the pencil lines. Then flipping it over to excavate it behind the soundboard. I counted the turns on the brace drill so all holes were of the same depth and none went through. Drilling out the bulk makes it so much easier. And then onwards. You might think to yourself by now, why isn't he using a router? Well guess what, I am. A Record no. 71 1/2. Look carefully and you'll notice that the wheel is above the notch, I had to to get it deep enough. 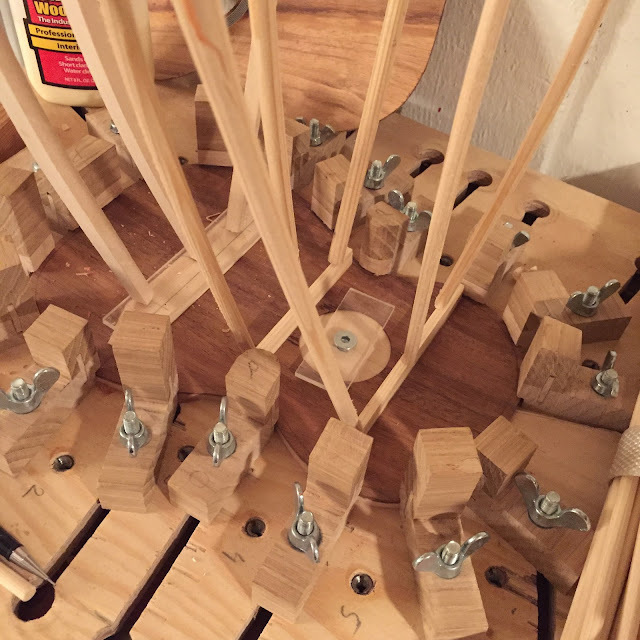 The first of the koa sopranos is coming along. The second will take a break for now, I was thinking only one project would be good for me now. But then my boy wants a miniature guitar, after seeing a guitalele in a store. 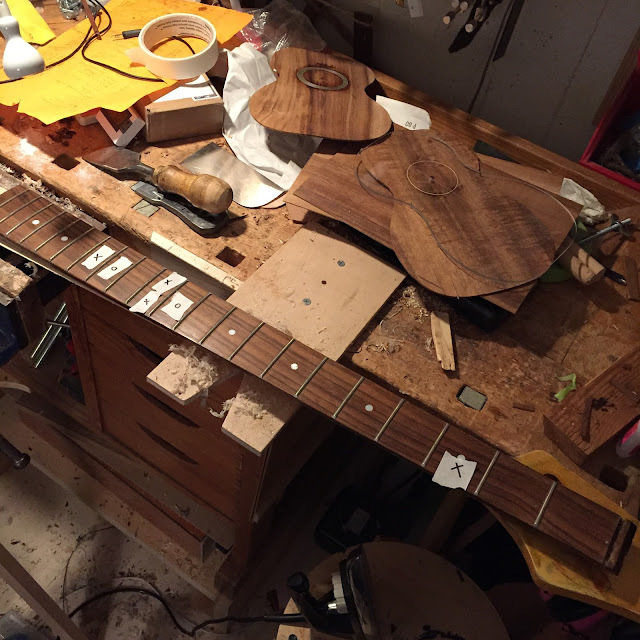 And my friend challenged me to build a cavaquinho. And I saw a super compact travel model uke and I want one. 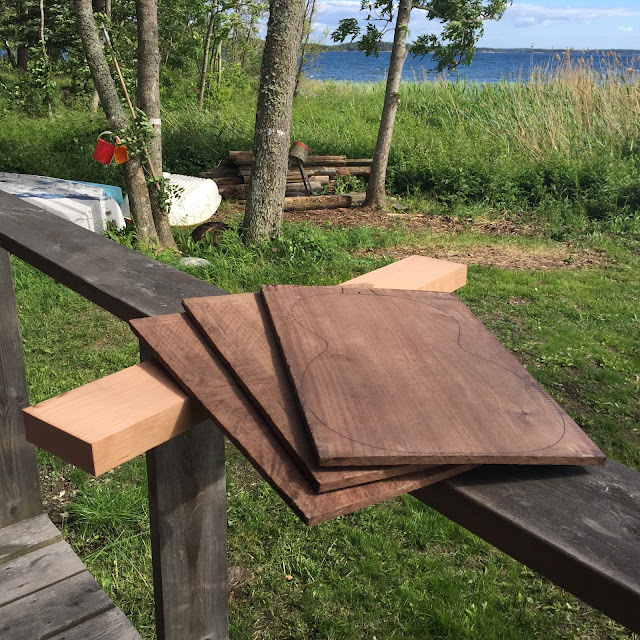 So we picked out some walnut for the sides and backs for the guitar and the 'quinho, and split it in three pieces so we have one spare. 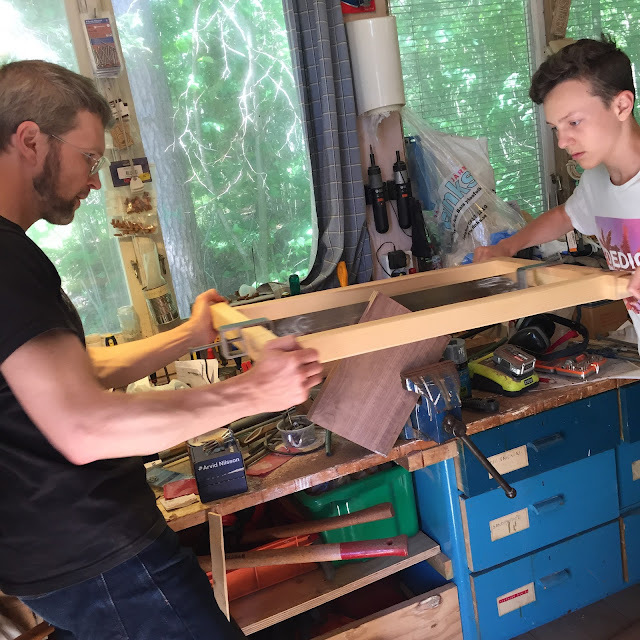 My condition for building the guitar was, predictably, that Johan would assist me at every stage. 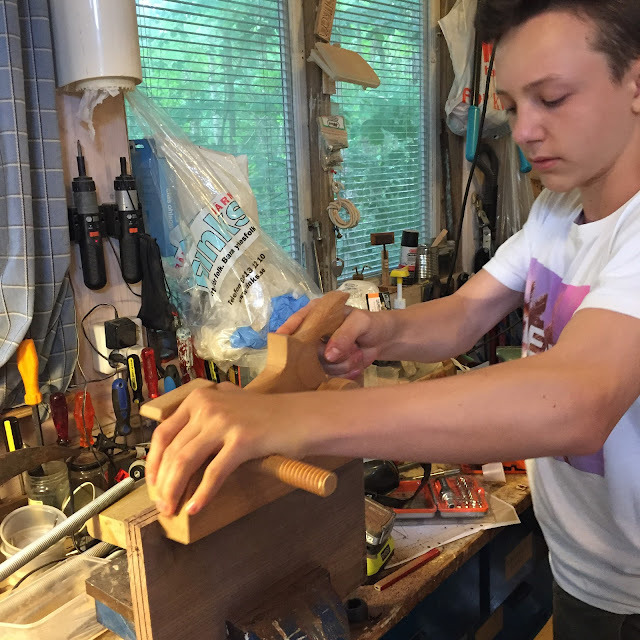 Here he works the kerfing plane. And here we use the frame saw - so much easier being two. Li took the pic. 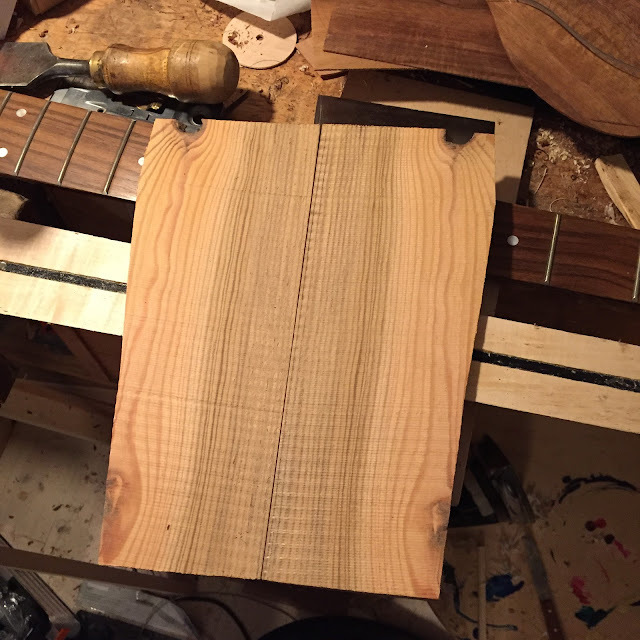 And here's the result, together with a cherry board that'll be transmogrified into a wee travel uke. 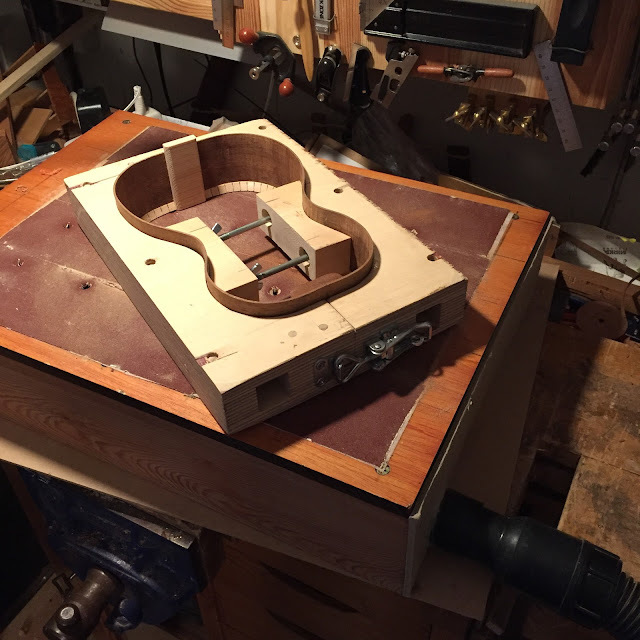 It was a while since I braced a soprano top. I went with the, hopefully correct, muscle memory and it was no problem at all. I went with a spruce bridge patch but will consider hardwood patches next time because of the string through bridge I use. But spruce works, with beads above the knots. 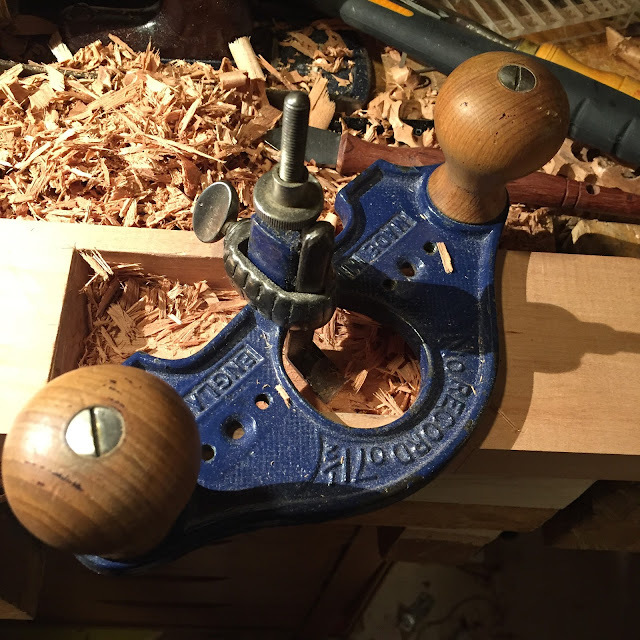 I deliberatly left the braces square because I enjoy shaping them in place. Since I made those sides for the two sopranos I've been working in Pakistan, but today I looked at the tops. 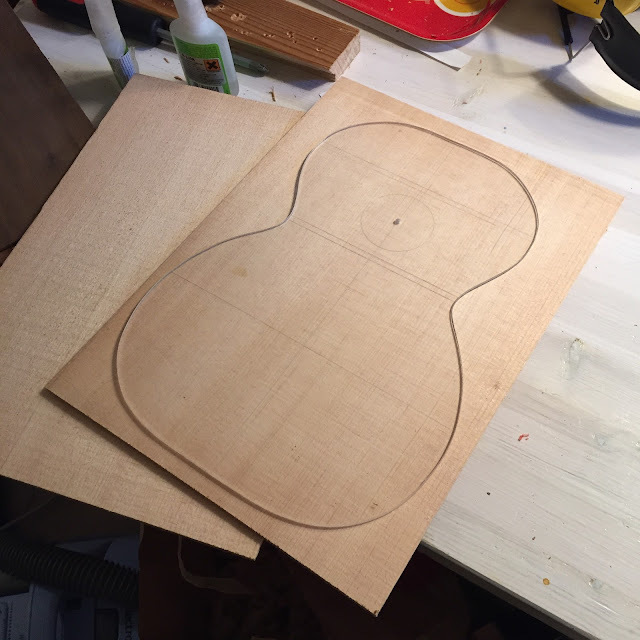 I wasn't a hundred percent happy with one of them so I thought about using a spruce top. And why not that ancient spruce I salvaged from an ancient boat long ago? Haven't decided yet, I did think that spruce should go onto a mahogany body but I was surprised and happy that I found the set easily. And didn't I get some yew..? Time to sort the wood pile I think. But now you must be wondering what that giant fretboard is doing in the pic. Recently I saw a strange Vox bass guitar with a body made from a wah pedal chassi. I want one of those but it was ridiculously expensive. So I thought I'll build my own won't I. First I bought some stuff to build a neck from, and a wah pedal chassi, but didn't get started until I stumbled upon a used neck that I thought would work. I bought it but it was a bit too long - it would give me a scale length that wouldn't fit the length of the wah pedal. And you can't shorten a neck, but you can shorten a fret board! I popped it from the neck with an iron and some patience. 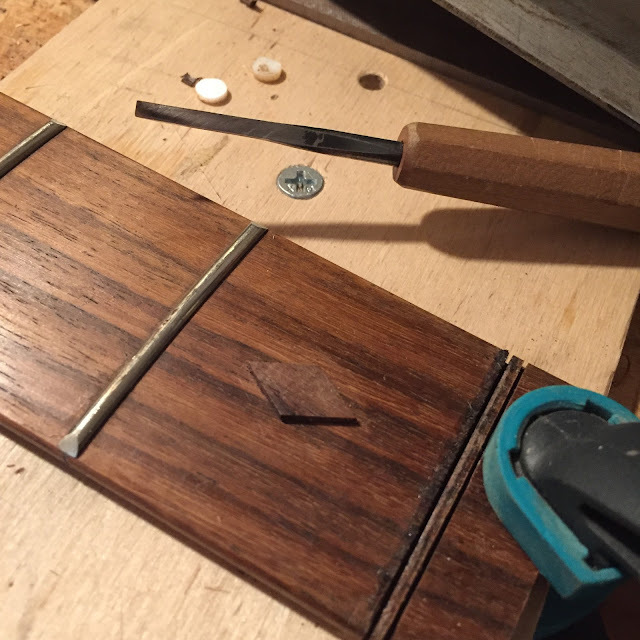 Two frets must come off from the nut end, quite easy. 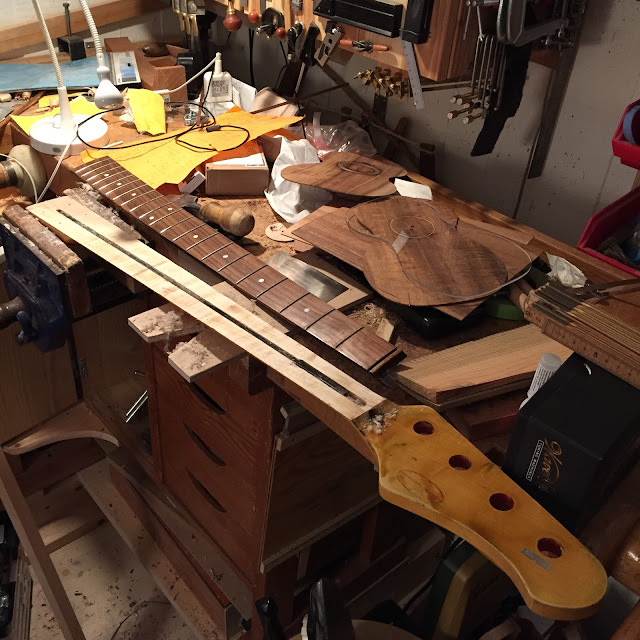 And removing only two will throw the least amount of fret markers off position, four must be removed and two new installed at the new ninth and twelth fret. I could have left a marker at the first fret, I saw a bass once that had that. But it was fugly so no, it goes. 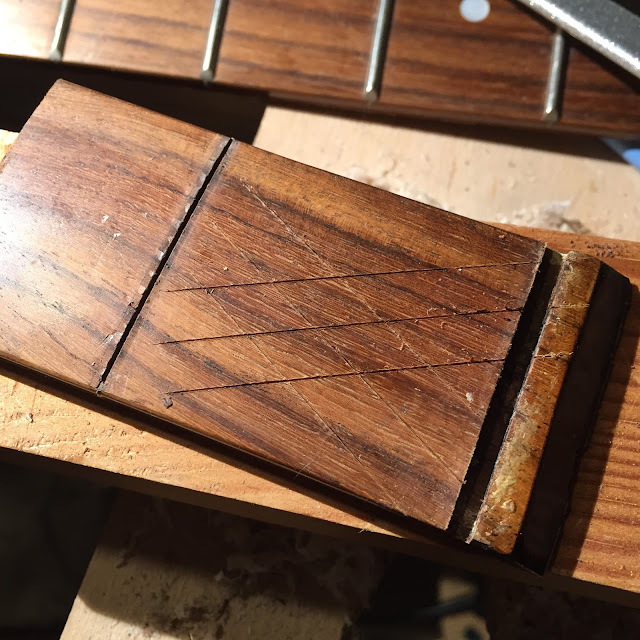 Using the wood from the two sawn off frets I made diamond shape plugs to inlay where the MOP dots were. And having missed taking pics of the cavity, here's the first plug glued in. Inlaying diamond shapes of wood is easier than those from other materials. I spot glued the plugs on top of the dot markers and traced the contour with a marking knife. 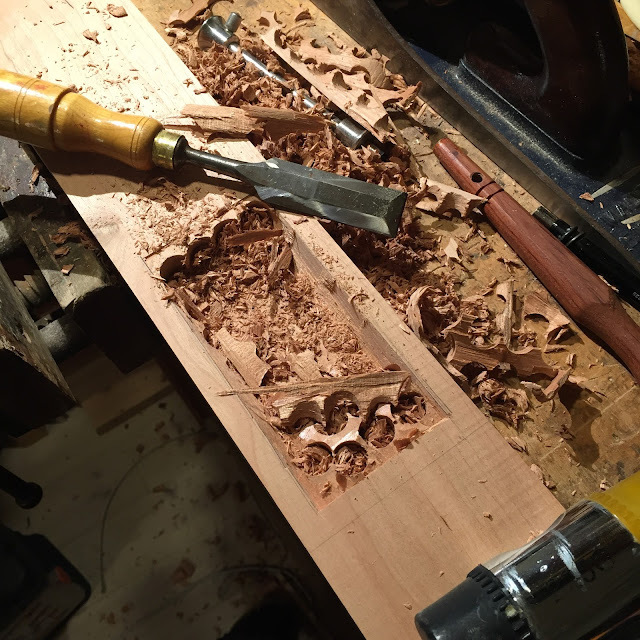 I chose not to use the router and made the cuts with a chisel. 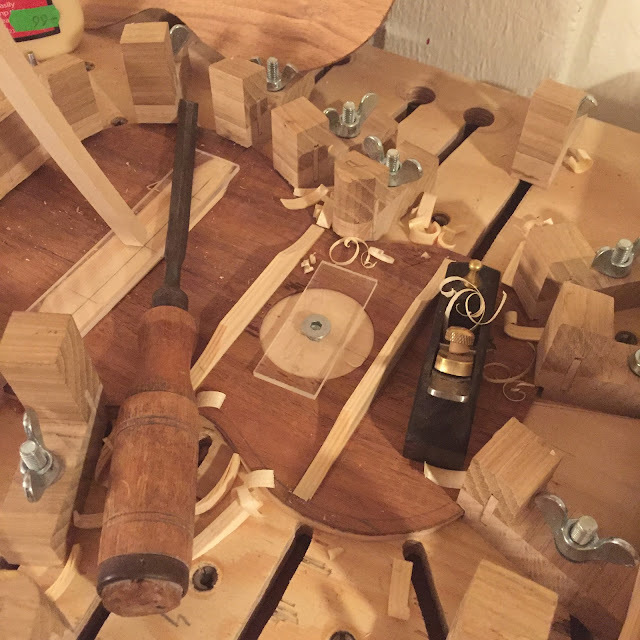 Once the cavity has the necessary depth, straight sides and sharp corners I could plane the sides of my plug a shaving or two at the time until it fit precisely. I made the sides so they slanted outwards a wee bit, giving a good snug fit after just a little thumping with a brass mallet. Fanx for reading. I'll post more about this, and about the sopranos.